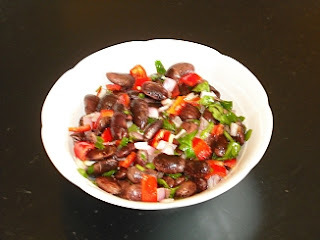 This is a salad recipe using what are called 'black' butter beans, which is traditional in Kastoria. Kastoria, in the north of Greece, is renowned for its beans and these particular butter beans, which are actually a very dark brown have a taste which is similar to the taste of chestnuts. The salad is very simple, though you need to soak the beans overnight. It is best served the following day, allowing the sald to absorb the vinegar and oil. Don't worry if you can't find the 'black' Kastoria butter (or 'elephant') beans where you live, it can also be made with ordinary butter beans. Boil the butterbeans and just before they come to the boil, skim off the foam at the top of the water. Boil for 10 minutes and then throw away the water and drain the butter beans. Put enough hot water back in the pan for the butter beans, bring the beans to the boil again and simmer for approx. 1½ hours, until they are tender. Mix them in a salad bowl with the rest of the ingredients. Leave overnight in the fridge and serve the following day. What a wonderful recipe. I love gigantes Kastorias. They indeed have a chestnut-y flavor. Thanks Magda- we like them too! We'll be posting another recipe with Gigantes Kastorias in the next few days.